With the impact of global warming increasingly affecting winters in the Alps a dynamic young ski company leads the field by going green. Chalet 1802 has gone carbon negative in order to offset its carbon footprint, offer clients an environmental option when booking their ski holidays and raise awareness about climate change within the ski industry. Last year was a bit of a shock with the warmest winter in 50 years in France. It was mild and the snow didn't settle, so a lot of the early skiing season in the Alps was patchy. We decided to go carbon negative to help preserve the ski resort. Thousands of skiers will soon be dusting down their salopettes and dashing off in search of the biggest snowfall. And doubtless the impact of our carbon footprint will be about as far down the list of holiday musts as a turkey sandwich after Christmas. But last year, a slow snowfall hit the headlines and holidaymakers panicked about the smattering of flakes melting almost as soon as they landed. Family-run online skiing company Chalet 1802, based at the foot of Mount Blanc in the French Alps, is one of the first independent ski companies to offer carbon negative ski holidays and give skiers an environmentally-friendly choice when booking their ski trip. Chalet 1802 owner, Matthew Dale said: "Last year was a bit of a shock with the warmest winter in 50 years in France. It was mild and the snow didn't settle, so a lot of the early skiing season in the Alps was patchy. We decided to go carbon negative to help preserve the ski resort." Partners, Matthew and Charlotte Richardson, both 27, moved to Chamonix from Devon four years ago. They set-up the company using Matthew's parents chalet in nearby Les Houches as a starting point for the fledgling business. After months of construction the couple have built up a successful skiing company with luxury holidays appealing to foodies and serious skiers. And they insist luxury does not have to come with a hefty environmental price tag. They collect fire wood from their own land, on the slopes of the famous Kandahar piste -- home to the World Cup downhill slalom -- and they have installed double-glazing, efficient wood burners, new boilers, dual flow toilets, energy efficient light bulbs and purchase all their electricity from carbon free sources. The Farmhouse chalet is decked out in re-claimed oak and thick insulation traps the heat in. The paperless company also recycles chalet waste including around 2, 000 bottles a year and staff are trained in environmental practices -- a window left open overnight in winter wastes enough energy to drive a car 35 miles. Charlotte said: "We are not trying to dictate to guests but we feel it's important to give them the choice without increasing the price of the holiday. If they book with us they can more than off-set their carbon footprint and we absorb the extra costs. Of course we still have a sauna and a hot tub -- people want luxury but not at the expense of the environment, so we looked at ways of lessening the impact of someone flying over here for a holiday." The company have also linked up with charity Climate Care, which tackles climate change by making carbon dioxide reductions on behalf of individuals and companies. 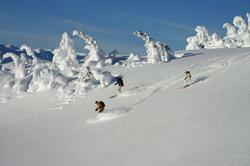 For more information on carbon negative skiing holidays offered by Chalet1802 visit chalet1802.co.uk.